“I've never heard of a crow that is afraid to fly,” the mouse said. “He's not afraid to fly. Shay is afraid of heights,” the butterfly added. The animals in the valley gathered around the brook, sipping water from its depths. Shay sat on top of a hill watching them. He sighed and stood, walking down to join them for a drink. Shay hung his head. 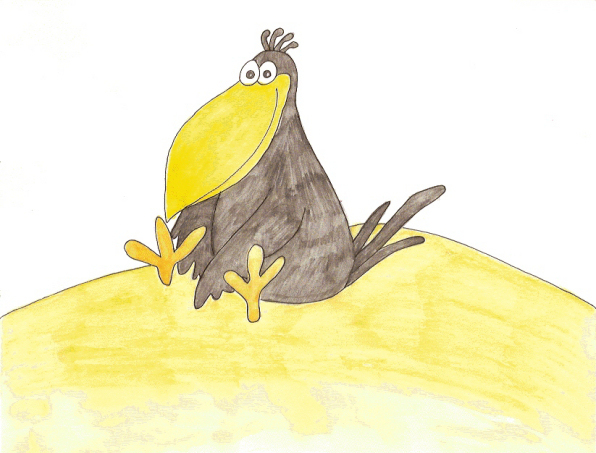 His long yellow beak dragged on the ground. “I don't want to talk about it,” he whispered and walked away. Shay looked up and saw the raccoon. “Oh no! The raccoon is stuck. Help him somebody.” None of the other animals came. “Help me, Shay. Fly up here and rescue me.” The raccoon shouted down to him. Shay shook his head back and forth. “I can't help you. I'm afraid of heights. Sorry.” He walked away. His yellow beak dragged on the ground. The animals watched the squirrel run up the rocks and climb the tree. It wrapped its tail around a branch. They ran off to hide and wait for Shay. “Help me! Help! Someone please rescue me!” the squirrel shouted down to the crow. The crow called for the others again, but none of them came. “I can't help you, squirrel. I'm afraid of heights. I'm sorry.” He walked on, his beak dragged on the ground. All week long the animals tried different things to get Shay's attention, but he wouldn't fly anywhere or try to rescue any of them. “He's a crow that walks,” the rabbit said. Never again did they play tricks on Shay. They accepted him for who he was. Shay was much happier too.